The house belongs to my neighbor. I can see it every day while I’m cleaning my dishes. That day, I felt it’s so match with the cloudy sky background; so, I captured it. Visit Monochrome Weekend for many amazing monochrome photos around the world. Lina, motif awannya so wonderful...!!! Gambar menarik dari rumah tetangga. 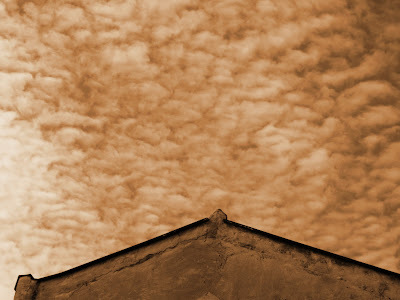 I love the clouds above the roof and they are so dramatic in sepia.